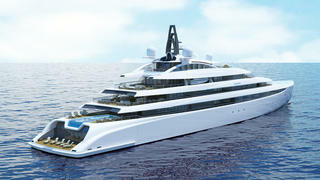 The first renderings of the 110 metre superyacht concept Project Acuore have been released by Monaco-based design studio The A Group. This new concept is the follow-up to the 100.8 metre I Dynasty, which was launched by Kusch Yachts in 2015 and hailed as the most complex yacht in history. Developed in response to a client request, Project Acuore features many signature styling cues from The A Group, including clean exterior lines and a vertical bow for increased fuel efficiency and seakeeping performance. 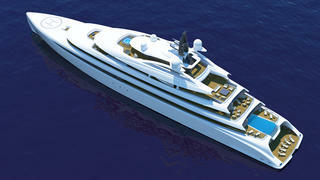 However, the designers add that the “glass shark fin” on the top deck is an all-new feature for this concept. The exterior spaces include a superyacht helipad on the enclosed foredeck and a 10.5 metre long infinity pool on the aft deck. The luxury facilities continue on the interior — Project Acuore would be fitted out with a cinema room, gymnasium with its own private fold-down sea terrace, massage and hairdressing rooms, and a full-beam spa area including a sauna and hammam. 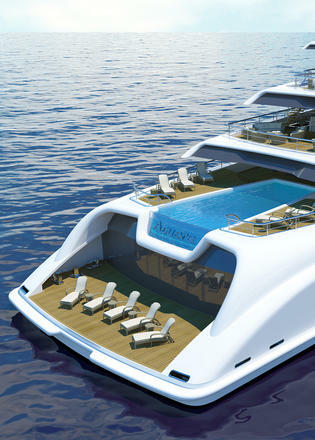 A glass-sided superyacht elevator connects all eight decks, or alternatively guests can use the half-moon staircase, which provides views to port and starboard. The generous interior volume allows for eight guest cabins, which feature exceptionally high ceilings, while the sun deck is dedicated to the owners, with private apartments, a family salon, a private Jacuzzi and observation lounge. 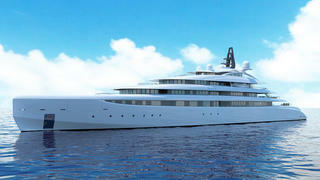 Further details, such as propulsion systems or construction schedules, are yet to be confirmed, however Project Acuore would comfortably rank amongst the top 200 largest yachts in the world once delivered.